10 drawings on paper (1 sheet) : ink ; 9.5 x 6 in. Ink portraits of eight men and two sketches of facial features from Gila River Relocation Center, Rivers, California on December 21, 1944, most identified by inscription. Top row, left portrait of the profile of a man, Mr. Morita, facing right. Morita wears glasses. Visible from shoulders up. Top row, center portrait of a mustached man, Mr. Kawaguchi, facing viewer and wearing shirt with lapels. Visible from neck up. Top row, right portrait of a man, Mr. Ozawa, wearing glasses that obscure his eyes. Ozawa has a broad face. He wears a shirt with lapels. Visible from neck up. Second row, left sketch of facial features, including mouth, nose, eyes and eyebrows. The eyes look to the right. Second row, center portrait of a man with head inclined and turned to the left. His eyes are downcast and hair is parted on the proper left. Visible from neck up. Second row, right portrait of a balding man, Yamada, facing viewer in a lapeled shirt. Visible from shoulders up. Third row, left portrait of a man turned facing right, looking to right. Visible from shoulders up. Third row, center portrait of a man, Mr. Sato, wearing glasses, his eyes appear closed. He inclines his head to the right. Third row, right sketch of facial features, including nose, eyebrows and closed eyes. Bottom row portrait of a man, Mr. Tanaka, turned slightly to the left, wearing a lapeled shirt. His eyes are closed. Visible from shoulders up. Drawing 97.106.2FD on verso of same sheet. Written in black ink, top right: 12-21-44. Written in black ink, top row (left to right): Mr. Morita [underlined], Mr. Kawaguchi [double underlined], Mr. Ozawa. Written in black ink, second row: Yamada. Written in black ink, third row: Mr. Sato. 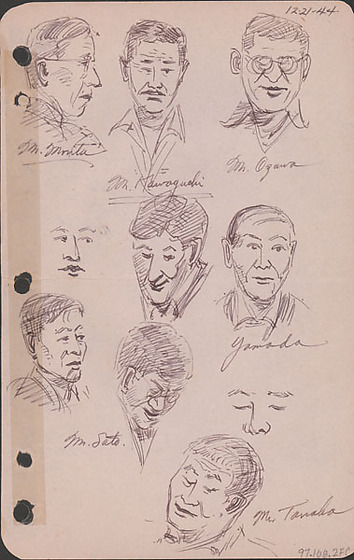 Written in black ink, bottom row: Mr. Tanaka.